I am showing three new works at Skulptur Projekte Münster this summer. Thermo generators which convert the heat of the fire directly into electricity play a central roll in these site specific works. Fire, in fact the first human technology serves as a power source for modern electronics and as catalyst for human communication. It was very much fun developing these new works for Münster in the past couple years. Skulptur Projekte has a faboulus team! I want to thank everyone in the production and the curatorial team very much! Please go and see the show. It is very good! Still up till 1st of October. heat of the candles is converted directly into 3V electricity to power the LED lamps. The bright and cold LED light contrasts the warmth flickr of the classic candle. Twice a day (every five hours) the guard is replacing the burned down candles. A standard home router is hanging in a parasitical way right next to commercial mobile phone antennas from the Münster TV tower. Vistors are invited to connect to this router with their phones. The router serves no Internet connectino but offers a large database of PDF tutorials on ‘How to live an offline life’. 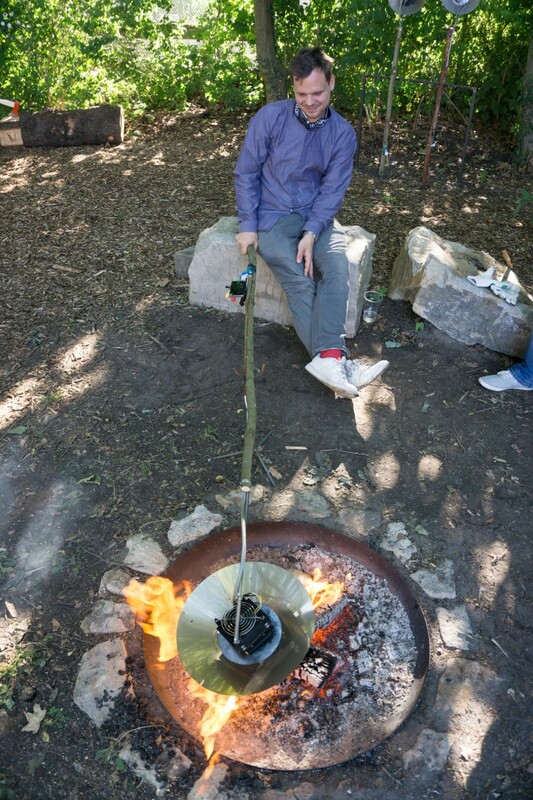 A thermo generator sitting on a small camping stove next to the playground provides 12 volt electricity to power the router which is connected through a 70 meter long orange cable. 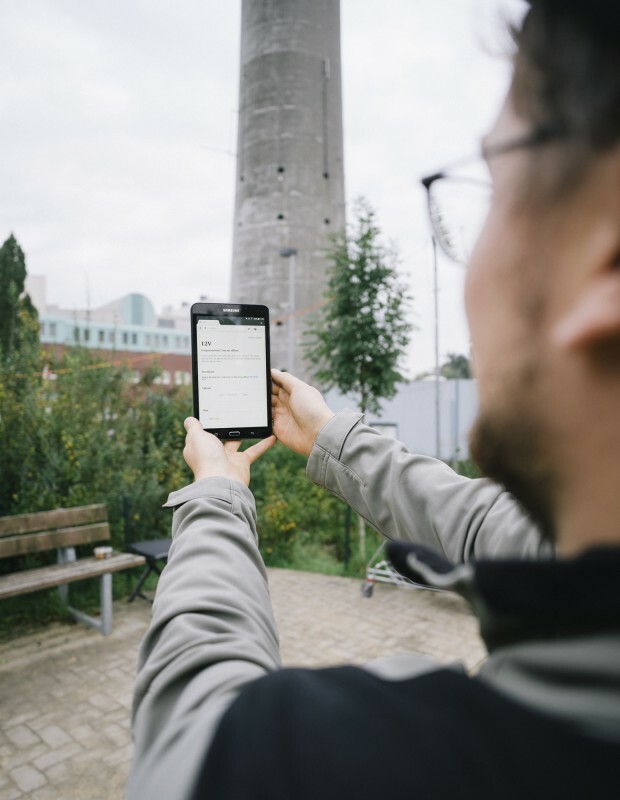 While the Telekom maintains one of its threet large data centers right next to the TV tower the site specific installation 12V is totally independet from powerlines or Internet connection. User can download and also upload files. Their connection cannot be traced or monitored by 3rd parties on the Internet. In its retro appearance, as a building for long range TV broadcast before the Internet the tower becomes a historic sculpture in itself. Aram Bartholl (* 1972 Bremen; lives in Berlin) deals with the possibilities and effects of increasing digitalization in his role as an installation and performance artist. Since the early 2000s he has been actively involved in the production of a digital public sphere—anonymity, open source, and hacking are the key buzzwords of this fledgling Internet generation. In 2010, as part of the project Dead Drops, he showed how conventional USB drives can be cemented into walls as dead letterboxes, thus initiating an on-going international wave of similar interventions. The drives allow data to be exchanged in the urban space without being stored and evaluated by algorithms on the Internet. Although it is normal for large amounts of data to be stored and sent on the Internet and for USB drives to be passed from hand to hand on a private basis, by publicly installing them in an urban setting, he creates disturbing situations for people and—in light of what is already happening and what might happen on any given day—fuels people’s anxieties. Bartholl’s installations in Münster are all based on thermoelectric devices that directly transform fire—the primeval medium of communication—into electrical energy. 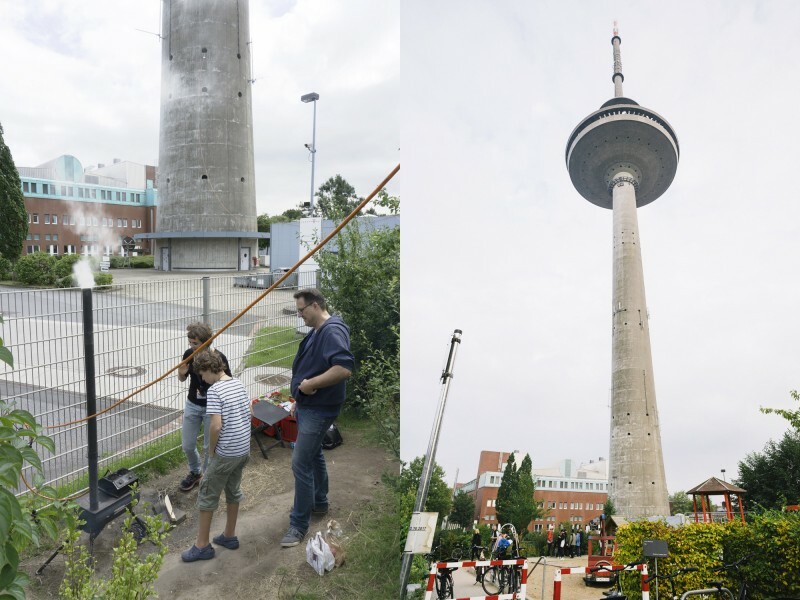 At the same time, the artist alludes to three construction projects that have played a key role in Münster’s urban development: the building of the palace (1767) and the canal-water pumping station (1901) and the installation of a DVB-T-antenna (2007) on top of the telecommunications tower. 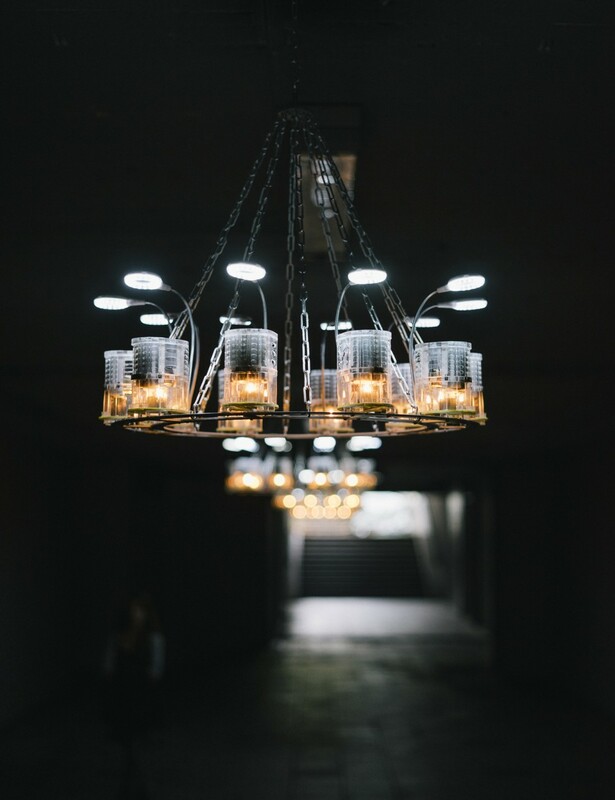 In the underground passageway leading to the palace square, Bartholl has hung up five chandeliers, each consisting of ten thermoelectric LED reading lamps powered by tea candles. 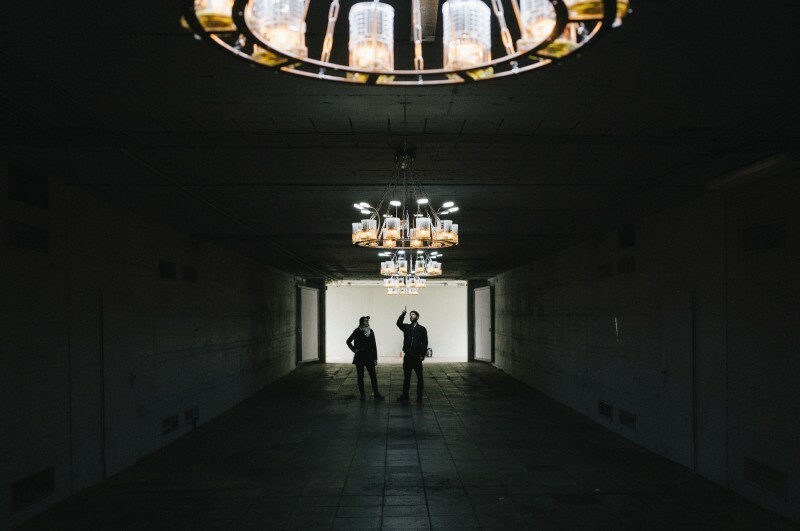 In the event of an emergency they could serve to illuminate a shelter. 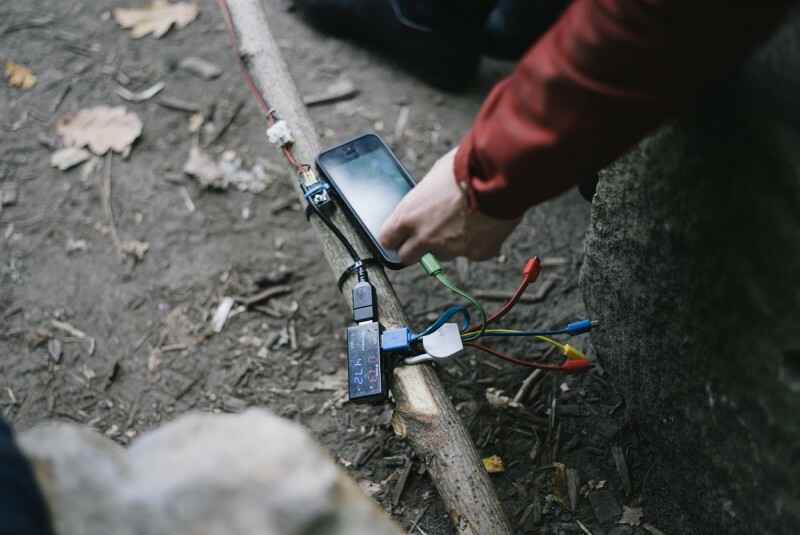 At Münster’s Theater im Pumpenhaus, Bartholl has provided devices for charging mobile phones: visitors can hold sticks—equipped with generators—in a campfire to charge their phone batteries. On the playground at the base of the telecommunications tower Bartholl has set up a small stove, equipped with a thermoelectric generator that provides electricity to the router on the tower without using the Internet. Visitors can log into an offline database via Wi-Fi to download instructions for living without the Internet and upload their own files. 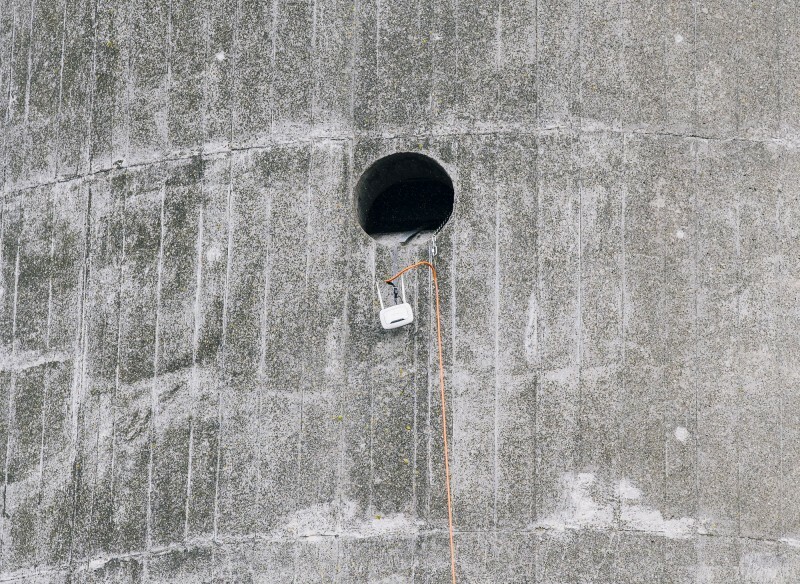 Bartholl’s playful and experimental work contributes to the demystification of technology. It prompts critical, self-determined, and independent interaction with the possibilities of digital networking and is based on an idea closely associated with technē: the arts are combined with craftsmanship, manual dexterity, and self-reflection. V.V. : We can start the interview with the end. Your works in Münster are a kind of survival kit for post-apocalyptic conditions. Is this the new end: a day without internet? For many people it’s a big drama if the internet goes down. Actually, it’s enough for the smartphone battery to get down to zero for panic to break out. We are dependent on devices and the internet to a great extend. If the internet were to completely go out for an extended period of time, all our infrastructure would collaps. What would it be like if there was no electricity and we had to charge our phones at a fire? Or we had to drive to a specific place in the city to get fresh data? Conditions like these are part of everyday life in other parts of the world. V.V. : Post-digital art is frequently related to technical developments and their effects. But in your case, the focus is on people. What kind of encounters you except around the campfire? How old are smartphones? It’s astonishing how natural it is for us to accept technological developments, along with all their side-effects, as the status quo. Social media change society and bring people closer, but they also estrange us. Charging a telephone at a campfire is an attempt to connect a very old, even archaic meeting place with our current world of communication. Work can activate devices, but, more importantly, it can reconnect people­ – not via an app, but through classic, direct contact. I expect exciting exchanges, new friendships, and much more. V.V. : You are one of the few artists who are consistently and actively exploring the digital shift in public spaces. What is the origin of this passion for public space? My penchant for public space comes from my childhood in the 1970s, a politically dynamic period with manydemonstrations, parties on the streets, etc. Later I studied architecture and devoted a great deal of time to public space in all its complexity. For me, outdoor space offers much more in the way of emotions, stimuli, and possibilities than the classic white cube. Public space is always in motion; there are people, problems, the pulse of life. And I make an effort to to explore the evolution of public space through the interconnectivity and digitaliziation. V.V. : Is the internet a public space? The internet isn’t a public space, even though we would like to believe it is. The news and social media platforms where we make our opinions known are 100 per cent private spaces belonging to publicly listed companies. We pay for our free use of these platforms with our data, which has been harvested by various nets and filters for some time now. My public space continues to be the city, with real people who need to prepare for all sorts of changes related to digitalization. V.V. : You displayed your first work of art at a Chaos Computer Club congress. Now you are an art professor, which people assume to be somewhat respectable, but you are now active in the team at the Hacker Congress. What attractions does this still have to offer? I have been invited into a wide variety of contexts with my work. This crossover between art, internet, architecture, design, and technology has always influenced my work. I have been active at CCC events since the late 1990s, and have repeatedlyexperimented with new work and projects there. For me it is important to keep leaving behind art, reality, and the internet and question things from a new perspective. V.V. : Do you think it’s bold that the café where we are talking right now doesn’t have Wi-Fi?